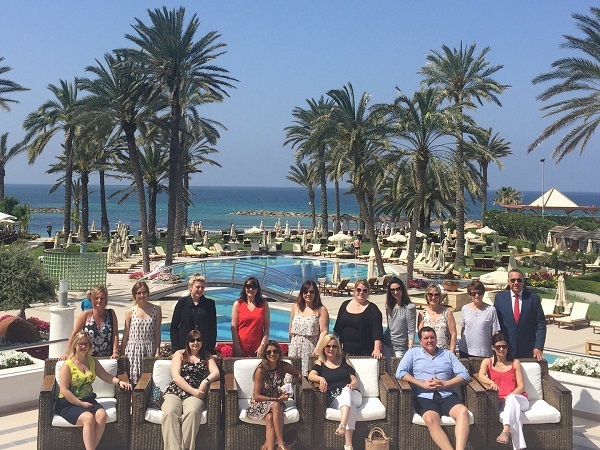 We recently held our Assistant Manager’s Conference within the beautiful surroundings of Cyprus. Group Retail Manager, Paul Hardwick, shares why Paphos is also a fantastic destination for a relaxing holiday in the sun. The EasyJet staff were excellent, in particular on the outward flight. They were friendly, personable and definitely added to the holiday experience. The return flight was just over five hours long and at night. In my opinion, this is just about as far as you can comfortably go on a low-cost airline. Although the new thin seats give you excellent legroom, they are quite uncomfortable on a flight of this duration. The Asimina Suites in Paphos is a boutique five-star, adults-only, all-suite hotel. It is situated on the outskirts of Paphos, but the old Paphos Harbour area can still be reached via a pleasant 25-30 minute walk along the beachfront, passing most of the other Paphos hotels en-route. It is owned by the Constantinou Bros. chain and is one of four hotels in the Paphos resort owned by the family-run company. The Asimina Suites consists of 110 spacious suites and our Fred. Olsen Travel group were all allocated large one-bedroom suites with a sea view. The rooms were sumptuous with all the mod-cons (including espresso machine) and luxurious bathrooms and amenities. On arrival at the hotel, all guests are welcomed with a glass of bubbly while the suitcases are transferred to your room. This lovely touch really does get your holiday off to the best possible start. The facilities at the hotel are fantastic with two large connected outdoor pools, one indoor pool, a fully-equipped gym and tennis courts. The hotel is perfect for a quiet, relaxing getaway and is geared up to be a luxurious sea-fronted hotel that’s perfect for couples. We dined at the fantastic Kymata beachfront restaurant on our final evening, prior to flying home. This alfresco, a la carte venue offers fine dining combined with amazing Mediterranean views and was definitely a highlight of the stay. 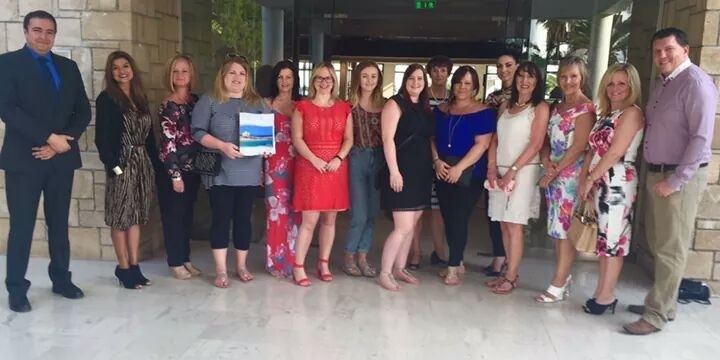 Prestige Holidays and Constantinou Bros Hotels had worked with the Cyprus Tourism Organisation to put together a fantastic few days highlighting what the resort and region of Paphos have to offer. One of the highlights of this was a visit to Mrs Sophia's place in Letymbou Village in the hills north of Paphos. Mrs Sophia welcomed us into her home to show us how she makes traditional Cypriot bread and halloumi, before treating us to a fantastic lunch with amazing pomelo fruit from her trees for dessert. Traditional Cypriot coffee was then served, which is made by cooking on heated up sand – it’s very strong and definitely shouldn’t be tried prior to bed! After saying goodbye to Mrs Sophia, we travelled further up into the hills to visit the Tsangarides Winery. This family-run winery is making some of the most popular wines sold in Cyprus and we were given a guided tour of the cellars, fermenting plant and bottling area. The owner gave us detailed descriptions of the processes undertaken and the difference between the various wines they make. It was fascinating to hear how red grapes can still make white wine if you take the skin of the grape off as it is only the skin which produces the red colour. After the tour, we were given a wine tasting experience including hints and tips on how to tell the year and type of wine and also how to tell if the wine has been corked. It was a fantastic afternoon in the sunshine and an example of why we feel we have the best job in the world. That evening, the group were hosted by the Cyprus Tourism Organisation at the Hondros Tavern in Paphos, which claims to be the oldest Taverna in the town (although we did spot a few other tavernas claiming the same!). We had a fantastic banquet of Cypriot Mezze which seemed to go on forever. One tip, when enjoying a mezze, is to not fill up on the gorgeous bread at the beginning as the later dishes are well worth waiting for. After filling up on some lovely food and wine, the group headed out to sample the delights of the Paphos nightlife. Although it was still very early on in the season, the nightlife was busy and, with bars competing to get revellers into bars and clubs, it is easy to see how people get carried away with all the free shots on offer. During our stay in Paphos, we also visited other hotels to find out about which would suit different holidaymakers when booking with Fred. Olsen Travel. My favourite was the Annabelle which is a fantastic five-star hotel. It’s refined, upmarket, stylish and only a short walk from the old harbour. The hotel is a firm favourite of Fred. Olsen Travel customers and it is easy to see why – it’s geared around unrivalled customer service, a relaxing atmosphere and fantastic dining. Like Fred. Olsen Travel, it generates excellent repeat business and, although this is my second visit to this hotel, like most other guests, I am sure it won't be my last. We also visited the Olympic Lagoon Resort, which is an excellent five-star, all-Inclusive resort that’s perfect for families. This resort has a huge array of facilities and, with a separate adults-only wing, would be a perfect option for multi-generation families. Grandparents could have the best of both worlds and spend some quiet time on their own and time with the children and grandkids. Another favourite of Fred. Olsen Travel customers is the Elysium hotel, situated a few minutes’ drive from the old town and adjacent to the Tomb of the Kings Road on the west coast. The hotel is excellent for couples and families alike and the buffet lunch we enjoyed here would rival the best available on any cruise ship - an afternoon nap is definitely called for afterwards. One of my favourite parts of my job is taking staff from all of our different shops to experience new destinations and for staff from across the country to come together and share ideas and experiences. It’s a great way for them to acquire invaluable knowledge surrounding a destination and I believe this highlights why so many customers trust us with booking their holidays. Prestige Holidays have been one of our preferred partners for many years now and their own customer service levels match those we so highly regard ourselves with. 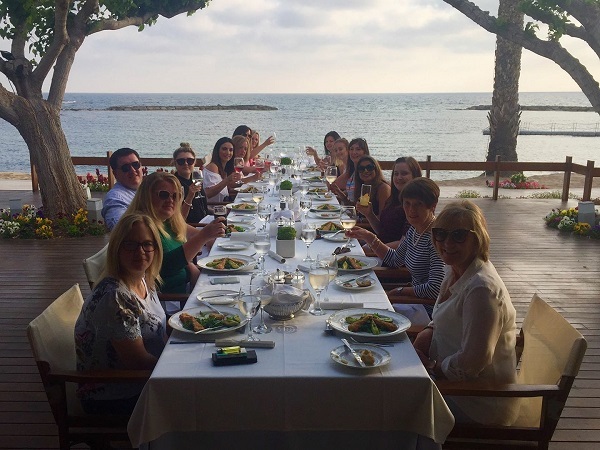 The passion for selling such an amazing destination shown by my staff when they come back is why we make sure all of our team get to travel on a regular basis. This also allows us to continue to develop our knowledge so we can recommend holidays to our customers that we know they will love and enjoy. Cyprus offers something for everyone, fantastic weather, amazing food, luxurious hotels, history, beaches, culture, friendly people and experiences to remember. A destination that can be enjoyed by all and easily accepted from most major airports in the UK. Every year, I take each of our Assistant Managers from our retail branches around the country on our annual conference. This allows us to get together as a group from around the country and experience a destination and product alongside one of our preferred tour operators. We travelled to the airport with our local taxi transfer companies in East Anglia and on the South Coast, which is really the best way to start a holiday and takes away all of the stress and hassle. These trips allow us to build up amazing destination knowledge across all of our stores and follow on from previous visits to Morocco, Sicily, Florence, Germany, Mallorca and Dublin, along with cruises from Star Clippers, Pullmantur Cruises and AmaWaterways. This is on top of our regular educational trips to fantastic countries all around the world. Our staff are our most valuable asset and by Fred. Olsen Travel investing in them, I believe we are allowing them to offer YOU, our customers, the very best service and knowledge in the industry. Must try? Cypriot Mezze - bring your appetite! If you would like to soak up the sun in Cyprus too, our team will be happy to share their experiences. Visit any of our travel agents in Essex, Suffolk, Norfolk and along the South Coast to benefit from their advice.